Expedia has some outstanding Bengaluru packages waiting for you. Combining your airfares and lodgings is one of the easiest ways to save cash on your upcoming trip. Savvy jetsetters can gain savings of up to 59%* by securing a package deal on Expedia. In a matter of minutes, you'll be able to sort out everything you need for your next adventure with our exhaustive database. And — with more than 400 partner airlines and 321,000 properties from all over the world, you'll have the flexibility to be fussy! Almost all accommodations can be changed without any additional charges from us. It can be quite pleasant to just roam the streets when you're in a new destination, but sometimes it's a good idea to form a plan. Grab your itinerary — we have loads of cool ideas for your impending Bengaluru holiday. You're going to be surrounded by significant things to do and see, like the ISKCON Temple and Bangalore Palace. If you're wanting to make the most of your urban adventure, then check out Vidhana Soudha and the Bull Temple. Many trailblazers and great minds have studied within the walls of Indian Institute of Science. Learn about its lengthy history and achievements, and roam the campus on a guided tour. Adventurers in this destination have an abundance of choice. Cubbon Park is a lush haven that's easily accessible from the main downtown area. After an exciting morning of sightseeing, recline under its shady trees. Still have some time to spare? If you'd like to find some spiritual enlightenment on your holiday, visit St. Mary's Basilica. Who knows, you may even glimpse the answers to one or two of life's most puzzling questions! Looking to make some wonderful memories? A getaway is the perfect time to jump into a few entertaining new experiences. Buying a Bengaluru Airport Same Day Luggage Services is a great way to start off your Bengaluru adventure. 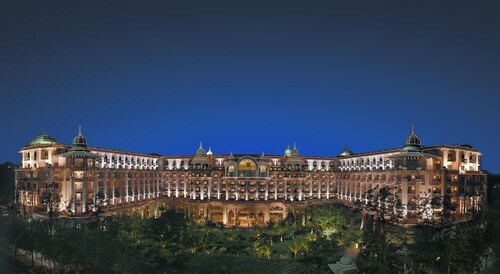 For the entire list of options, head to our Bengaluru things to do page. After a big day of wandering in Bengaluru, have a snooze in one of 227 accommodations. The best cheap holidays and luxury getaways are just the beginning at Expedia. Those who delight in the good life will be sure to enjoy The Ritz-Carlton, Bangalore (Number 99 Residency Road) and the Taj West End (#25 Race Course Road). Rather somewhere less expensive? Check out the Golden Residency (#28, 2nd Main Rd,4th cross, Opp Kanishk) and the Sairam Residency Boutique Hotel (No.1, 2nd Main, 6th Cross). Kempegowda International Airport (BLR) is the starting point for most travellers taking a trip to Bengaluru. It's situated 15 miles (24 km) from the downtown area. Visit this large and lavishly decorated temple complex dedicated to a Hindu god. Marvel at golden shrines, murals and hundreds of statues. Stroll through crafted gardens and admire resplendent interiors in a stunning palace that seamlessly blends Indian and Tudor styles. Take a break from the city in this garden paradise, where natural landscaping and diverse plant displays complement its historic buildings. These exotic gardens are home to century-old trees, rare flowers from around the globe and Bengaluru's version of London's Crystal Palace glass house. 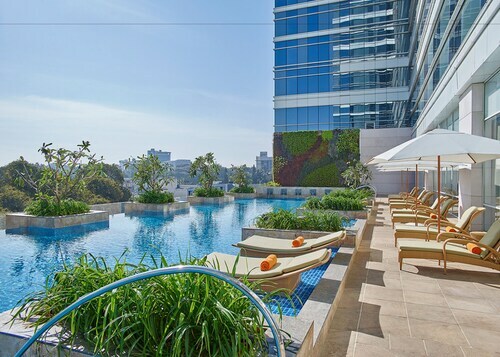 This family-friendly Bengaluru hotel is located in the entertainment district, within 1 mi (2 km) of Brigade Road, M.G. Road and Commercial Street. Cubbon Park and UB City are also within 2 miles (3 km). Trinity Station is 6 minutes by foot and Halasuru Station is 14 minutes. 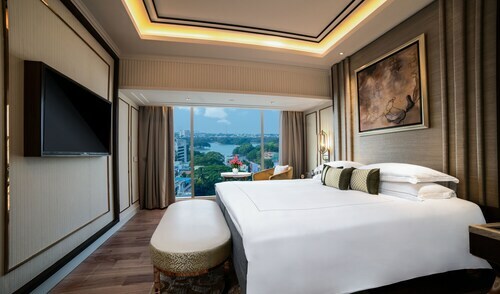 This family-friendly Bengaluru hotel is located in the business district, within 1 mi (2 km) of National Gallery of Modern Art, Cubbon Park and Vidhana Soudha. M. Chinnaswamy Stadium and St. Mary's Basilica are also within 2 mi (3 km). Bangalore Cantonment Station is 15 minutes by foot. 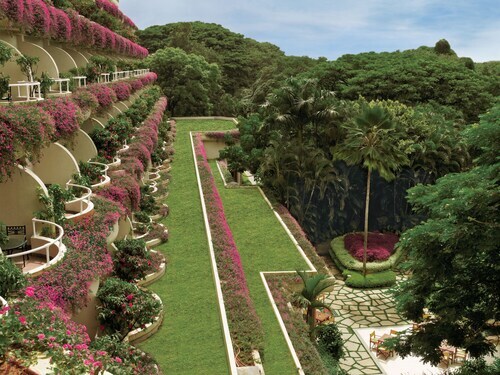 Located in Ulsoor, this luxury hotel is within 1 mile (2 km) of Ulsoor Lake and M.G. Road. Commercial Street and Cubbon Park are also within 2 miles (3 km). Halasuru Station is 8 minutes by foot and Trinity Station is 12 minutes. This family-friendly Bengaluru hotel is located in the business district, within 1 mi (2 km) of M.G. Road and Garuda Mall. Vidhana Soudha is 2.3 mi (3.6 km) away. Trinity Station is 6 minutes by foot and Halasuru Station is 12 minutes. This family-friendly hotel is located in Bengaluru (Bangalore City Center), close to UB City, Brigade Road and Garuda Mall. Also nearby are Visvesvaraya Industrial and Technological Museum and Jawaharlal Nehru Planetarium.